I've put in a fair number of small RV Improvements and tinkerings, that just don't amount to enough to build a whole page just for each one of them alone. Bunchin' 'em up into a 'group' page seemed to make sense , so here are the ones I don't think I've put anywhere else yet. I don't expect you can have too many hooks. Just be a little careful exactly where you put 'em. Running into a poorly placed coat hook, in the dark, at 1AM on your way to the bathroom, is not going to improve your disposition any. I'll guess you won't be considering that hook one of your RV Improvements! The second here isn't really an RV Add-On. I would consider it an RV Improvement though. I couldn't actually come up with a good 'category' for it, so I just threw it in here. It's really sort of an 'RV Removal'. Surrounding virtually every window, of every RV I've ever walked in, hanging down from the valances which shroud the blinds, are curtain 'swags'. They do nothing, collect dust and actually cut down on the percieved size of the window. Take a look at them. They cover two or three inches of window. I know it's an effort to class up the rigs, and add some high fashion, but they do it, in my opinion, at too high a cost in window function. This was called to my attention some time ago, on a site I can't find again.... so I can't claim to have figured this out on my own. I'll just try and pass it on here. When you take the darn things off, the affect is pretty amazing to me. The space seems to get larger. The window seems to be bigger... mostly because you can now see through those couple of inches of glass that used to be covered by curtain... so, in affect, the windows are larger! You'll also notice a much greater ease in using the window knobs and mini blind controls. Bottom line is, sometimes a space will work better, if it only - Looks - like it's bigger. One of the simplest of RV Improvements is a closet rod in the shower. 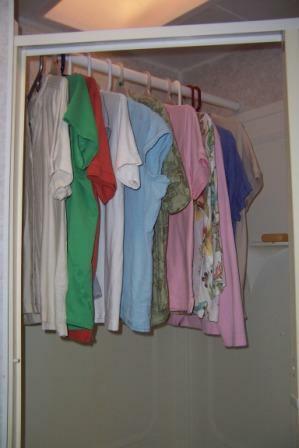 If you set one to run across the shower you can hang wet clothes that need a little extra dry time before you put 'em in the closet. Since this area is a high moisture spot, I'd use the plastic variety of hanger and a plastic/synthetic rod. When you're going to take a shower, just lift the rod out, pull the vacuum out, if you keep it there like we do, and start scrubbin'. One of my gripes with laundromats is they seem to 'keep' the dryers running poorly... forcing you to keep pumping quarters in to get your duds dry.... hmmmm...... sounds like a conspiracy don't it? :-) Anyway, whether you are hand washing something in camp, or just need to dry some laundromat 'washed and dried' a little drier, this RV Improvement should oughta do the trick in a convenient way. You won't have to worry about some varmint stealing that fancy T-shirt you had to hang outside to dry either! Here's one for those of you who travel with pets.... assuming that pet uses a litter box. 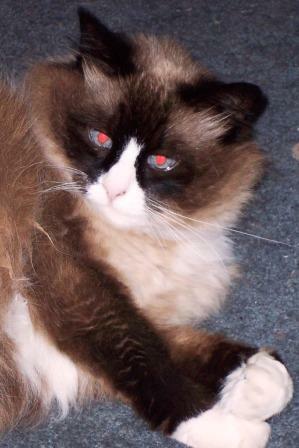 We have, traveling with us, along with the two Aussies; Bonnie the barn cat. We're not sure how old she is at this point, (2007) because we can't remember if she came to us in 1991 or 1992. Either way she's fifteen or sixteen. She's the first half of Bonnie and Clyde. Anyway, when we left the ranch, she came with us. I just couldn't bring myself to leave her there. I'm not what you might consider a 'cat person'. Their arrogance kind of tics me off. But any little critter that can out 'Wily' the Coyotes for 10 years, and hunt rats like she can, is a friend of mine, arrogant or not. Now in the past, when we made a circle, she just stayed home. 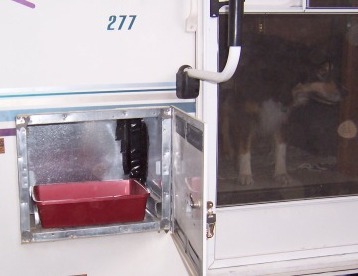 Since we sold the house and moved into the fifth wheel, she had to come with us; enter the RV Litter Box issue. For a while, that nasty thing has been sitting on the floor in the bathroom. 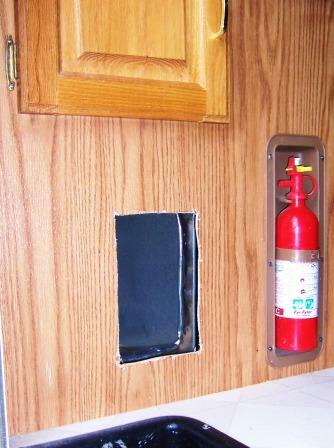 When talkin' RV Improvements, this one is a mite awkward to say the least. Nothing like trying to keep your foot out of the dang thing when you're trying to shave first thing in the morning! There ain't a lot of room in our bathroom. Even for a spindly lil' runt like me. But where else could I put the dang thing? I thought of puttng a door into the hamper bin and making that a private toilet for her... but then where do we put the laundry? 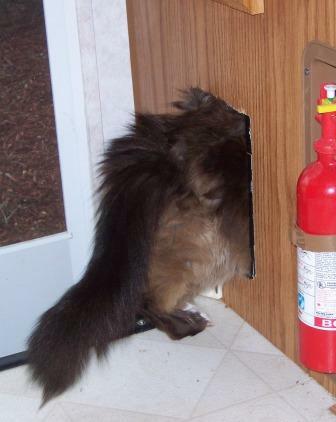 There were no areas under any cabinets, unused and large enough to hold the litter box.... except.... wait! I've got it! The battery compartment! Yes! Last fall, when I installed the new battery compartment, up front, for the solar system, the factory battery compartment around the side, was emptied and has been sitting empty ever since. It's a little snug, but I think it might just work! All I had to do was cut through the base of the kitchen counter cabinet; cut through the tin of the battery box. Fold the jagged, cut metal over; dress up the wood with a little moulding and wa la! a private kitty toilet! Not a bad option for an RV Litter box. 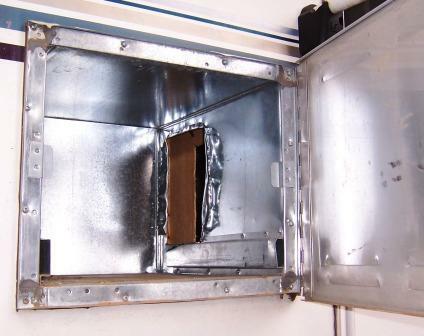 A lot of folks with motorhomes have found a 'route' where they can put a tunnel down through a cabinet into one of the 'basement' compartments. Makes a much better arrangement than sitting on the floor in the main living area. Nice when you're cleaning it too. Easy access from outside. Now, all I have to do is 'train' an arrogant cat to use the 'RV Improvements' litter box compartment. We've put a little food dish in a corner of it. If she wants to eat... she's got to go in there and get it.... she's doing that now so I am hopeful she'll start using the litter box that's in there and we'll start feeding her elsewhere again... and I can take the 'old' litter box out of OUR bathroom. When I had the bumper cut off the rear of the Jayco, for the installation of my Motorcycle carrier, I lost the carrier for the 3" sewer hose. 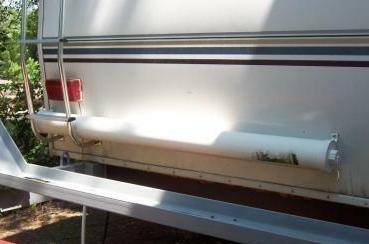 This amounted to RV Improvements that fix unintended consequences! That loss was easily remedied with a plastic sewer hose carrier from Camping World. I just screwed it to the real, wall of the fifth wheel, just above the bottom. It's out of the way and convenient to where my waste connections are located on the rig. 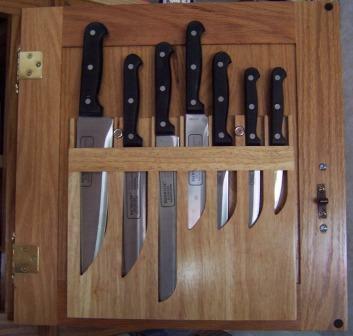 A little thing, as RV Improvements go, that saves some space is this knife holder. The old one was a big cumbersome Block, that sat on and took up way too much of our limited counter space. I screwed this thin carrier to the inside of a cabinet door. Uses some out of the way space, keeps the knives convenient and opens up that precious counter space... of which we have too little! 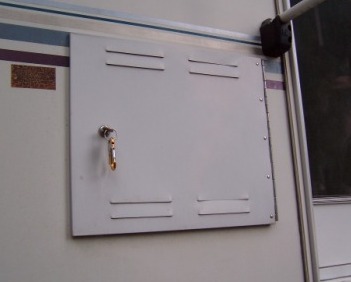 One of the RV Improvements most people forget about... myself included, is one that guards a critical 'tool' ; your keys. You're just gettng back from a long hike; Maybe you did some rock scrambling.... or you found a secluded, pretty little pool back in the bush and went skinny dippin' with your lady! (Ain't that a pretty picture? a chicken legged, sunburnt, naked old man splashin' around in a mountain pool? ):-O ... but then, you get back to the rig and D---! You're keys are gone... you're sitting parked, 30 miles from anywhere and the door is securely locked and your only other keys are hanging on a hook ~ inside. That ain't gonna work very well.... get a magnetic 'Key Safe' and stick it in some hidden location up under the frame of the rig. (Truck keys under the Truck... RV keys under the RV) Crawl around and find some good, out-of-easy-sight location to stick the thing. You don't want any 'looky lous' finding it easy. A place that you can't 'see' but can reach into, to stick the magnet, is just right. It'll be a lot better than having to pay a lock smith to venture way out yonder, for sure and for certain. There are plenty more gizmo's, gadgets and RV Improvements to shine up your rig to fit your needs and ways of goin'. All such things don't have to be made for an RV neither. Keep an open mind. Fire up your imagination. Find new ways to use old things to do the jobs you want done. If you're anything like me your rig will always be a work in progress. You'll find better ways of doing things every trip you make. One thing to keep in mind as you make adjustments to your rig with RV Improvements.... I'd suggest you make an effort to think in terms of simplicity and 'Less is More'.... If you can figure out a way to do a job, just as well, with a couple fewer parts, it's almost guaranteed to be an improvement.